After the delights of yesterday, today was distinctly less picturesque and was also rather frustrating as the South West Coast Path as marked on the map bears no resemblance to the marked path on the ground. I spent a good deal of time trying to find my way and having to back track as I reached dead ends. I met a fellow walker who informed me that the council has changed the route significantly – at least I haven’t lost all map reading skills overnight! 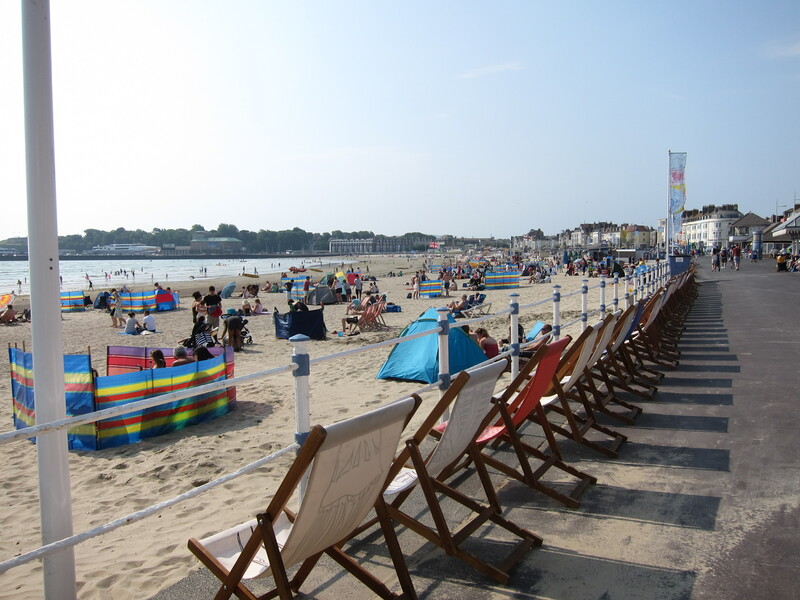 I drove to Weymouth and parked behind the station – there were already hundreds of people out, preparing for a day at the beach – children, prams, dogs, buckets and spades, beer coolers, parasols, towels, grandmas and bats and balls all crowding their way to the front. The town beach is beautifully sandy, unlike the shingly north end, but I resisted the temptation to paddle immediately and instead made for the old harbour. 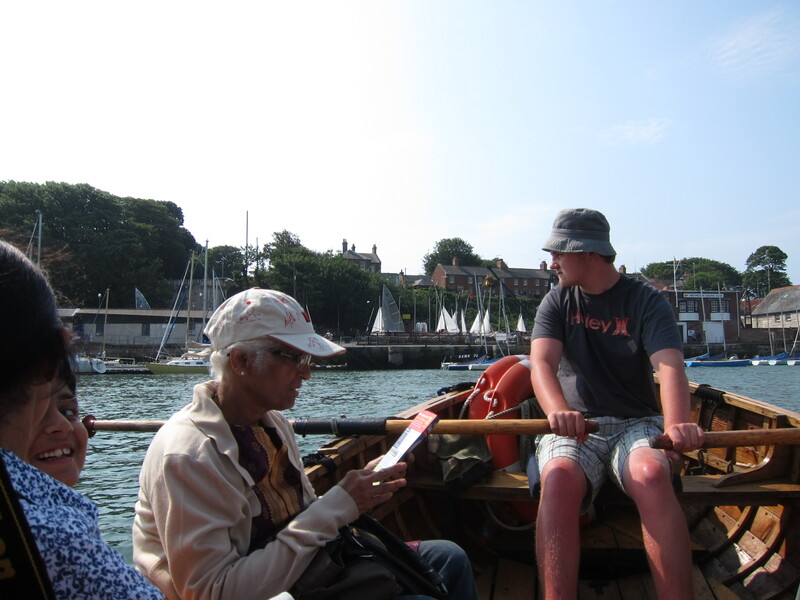 I crossed the harbour in a little rowing boat that plies back and forth for a pound – another form of transport ticked off! On the south side of the harbour are the rather attractive Nothe gardens, planted in a semi-tropical style, with South African and Australian plants, overlooking the enclosed harbour. Weymouth has a fascinating history – in its early days it held a wool staple, until that was transferred to Poole after French marauding. It was created as a Borough in 1571 combined of Weymouth and Melcombe Regis, the latter (the modern town centre) apparently being the place where the Black Death first arrived in Britain in 1348. Subsequently, Sir Christopher Wren was its MP, and it became a hot tourist town after King George III began to patronise it. For Jane Austen fans, it is the town where Jane Fairfax was rescued from certain death (according to Miss Bates) by Mr Dixon grabbing her sash when she nearly fell out of a boat. The town remained an important naval base and saw the testing of the bouncing bombs in the last war. 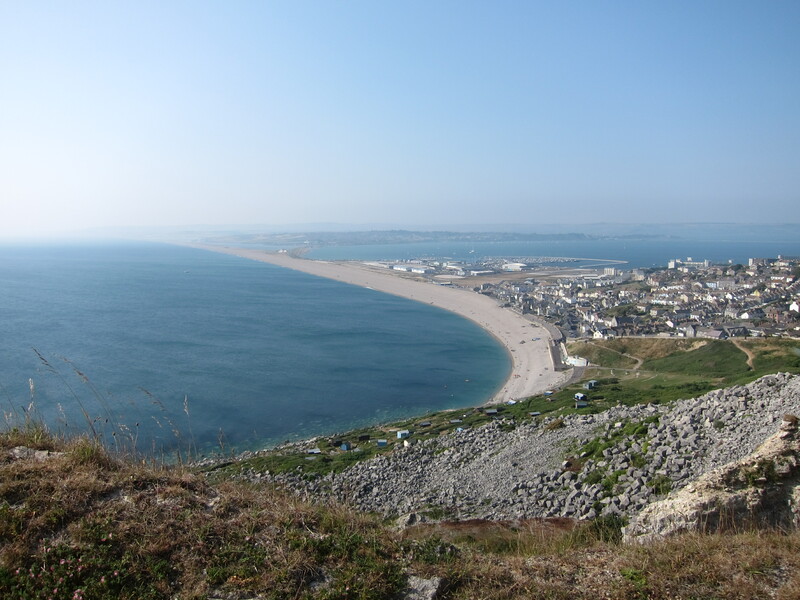 The path continues to the tip of the mainland, and the Isle of Portland lies ahead – I was in two minds as to whether Portland counts as the coast, but decided, since it is firmly anchored by the north end of the 18 mile long Chesil beach that it should be included. Crossing the 1.5 miles of causeway onto the island beside a busy road was very dull. 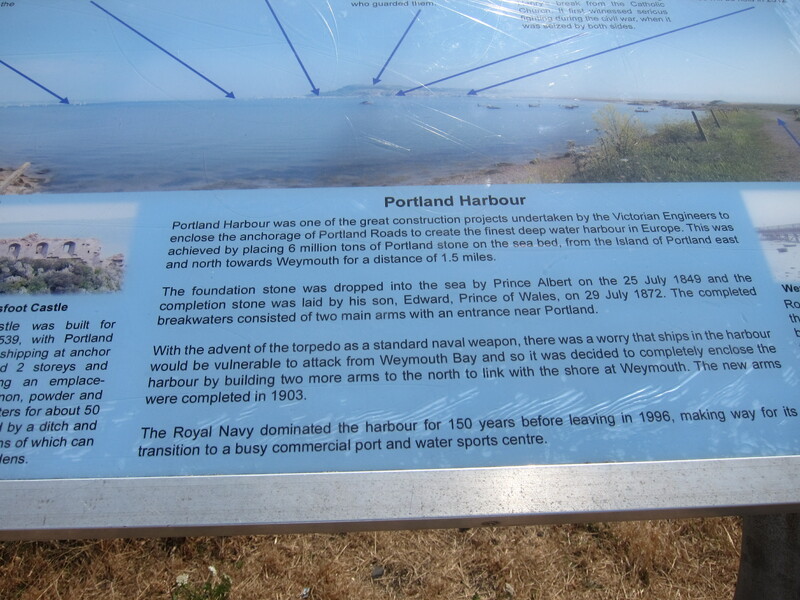 The path then winds (in fact, though not on the map) through the National Sailing Academy – interesting as this is where the Olympic boating events were held last year – to Portland Castle, another of Henry VIII’s castles. I am amazed at the number of fortifications he built – Deal, Dover, Portsmouth, Sandsfoot, Portland etc., largely funded by the wealth bagged from the Dissolution of the Monasteries. Prior to the Reformation, the peasants paid the Monks to protect them from hell, and after the Reformation, they paid the King to protect them from the French – no doubt both causes have merit! Eventually, there is a steep climb up to the cliffs, then along, past another battery and along the boundary fence of HM Young Offenders Institution. I suppose there are worse places to be banged up than overlooking the Channel. 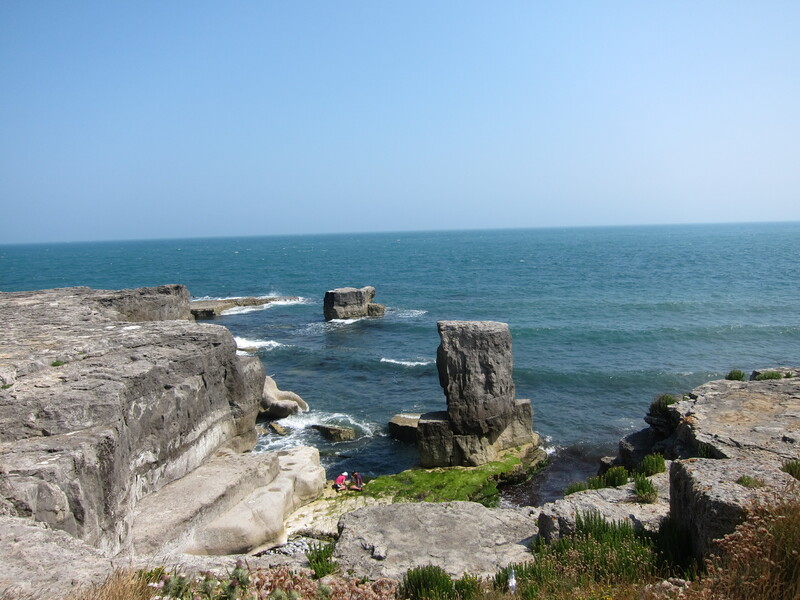 On the east side of the island where the cliffs are steep with a lower, rocky plateau, covered with valerian, are lots of areas where people were practising climbing – the porous limestone was covered with ropes and pulleys and little swinging figures. 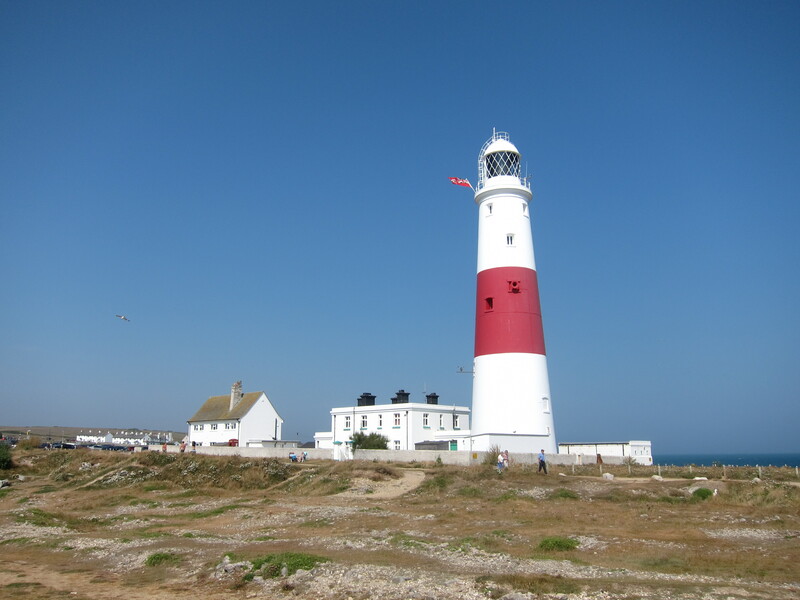 The path is uneventful round to the light house at Portland Bill, where I had a delightful Dorset cream tea. Rounding the headland, I carried on along the West side in the afternoon sunshine – with fabulous views of Chesil Beach. I arrived back in Weymouth around six and went for a delicious paddle to cool my tired feet. The water was warm but felt strangely thick – presumably from the chalk which seemed to be in the water, being deposited on the sand as a gloopy white mass. I also received my first donation for Guide Dogs for the Blind – £6.30. Very pleasing.